My training is best known for fast, happy and healthy dogs, tight turns and of course, running contacts and tricks. 3. teach your dog tricks – as many as you can think of: tricks teach you how to teach, they teach your dog how to learn and they also teach the dog that learning is fun, that you’re fun. 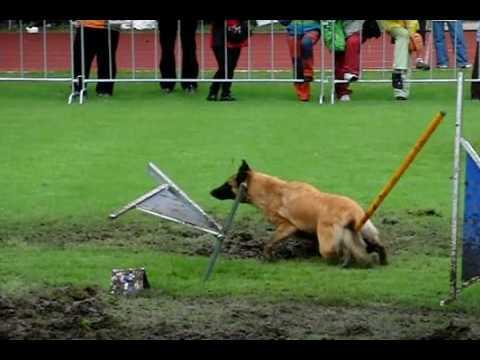 Side effect is total awareness of his body, tricks teach a dog how to use his body. Rear end and overall body awareness, balance, strength, power, flexibility and agility that my dogs excel in so much are all the side-effects of all the tricks they’ve learned. "Too much tricks" doesn't exist. If you don’t have any ideas, you can get some from our tricks videos. 4. teach your dog obedience. It’s very easy to motivate a dog for those 30s on agility course. It’s much harder to motivate your dog for long minutes of just heeling. If you want to learn about motivation, obedience is a way to go. 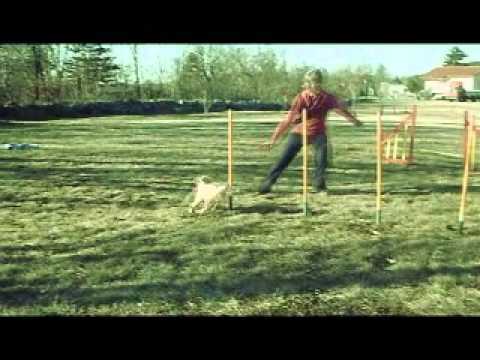 If you can make those long minutes of heeling fun to a dog, then making agility fun for your dog should be a piece of cake. 5. boost your dog’s confidence – only confident dog will dare to run at his maximal speed. Make sure your dog knows he is World Champion before you let him do his first jump. 6. don’t be afraid to do things your way. Books, videos and seminars are helpful, but no one knows your dog better as you do, especially after teaching him those 100 tricks and playing and walking with him every day, so… Trust your intuition and do what YOU think is best for your dog. Avoid those that think there is just one best way. Wary those who want to make you believe you need particular breed/method/handling tool/video in order to succeed. Were you told too that you MUST have a lead-out in order to win? Well, I won at least 90% of my runs with La for years. And she doesn’t stay. 7. if something goes wrong, always remember it’s your fault, caused either by your training or handling. That’s a good news since it gives you a power to fix it yourself too. Things would be much harder if it was dog’s fault. Luckily, they, unlike people, come without mistakes. 9. dogs work best when they work for themselves. Don’t ask them for a favour to work with you. Make them ask you for a favour to work with them. 10. you want agility training tips? If you follow the advise from above, agility gets so easy that you don’t need those. Just go out and have fun with your dog! What do you reckon to these just for some practising at home like Cik and Cap? Also, I have done next to no weave work with my two yet so that will come in handy. You can set it as a channel. I hope this link is ok. I saw this video clip of EO Silvia….absolutely horrific conditions. Definitely not safe for dogs and handlers…you didn’t have to run in this did you? Those poor dogs in the clip…it should have been stopped. I have a question about your verbal commands. Whe are are approaching a U shaped tunnel from a weird angle like one of the courses seen in a medium course at worlds this year, do you say left or right to indicate which side you want the dog to enter or do you just rely on body language? Hello Silvia, I have guestion about you and other “positive methods” trainers. I guess you know Susan Garrett and her methods. It is absolute reverse (dog has to come x dog mustn’t come) and now I just don’t know what should I think about the whole thing. I know you will say it’s better the first option because you do it so you think it’s the best you can do. But what do you think about other option? Is it acceptable or not for you? What do you think? Yeap, there is maybe even more differences between SG and Silvia but just as Caroline said -- it seems both ways work! And that’s what I’m curious about. Does it really depends on type of dog or is it just personal preference? Does someone have experiences with both? So sorry to learn about Lo Silvia ! I would like to know how you, Silvia, get the firm trusting relationship with your dogs. I know you spend a lot of time with them, walking, hiking and doing tricks. But you have also said you don’t have a lot of rules and that you don’t limit time with a dog to just “training time” so they want to work for you because it is the only time they have with you. If I understand it right you have all your dogs with you most of the time and yet they will still find you the most interesting. What advice do you have for others where they can’t hold their dogs attention or what can they do to be the most interesting thing so dog wants them above other distractions, other dogs, animals etc.? I am guessing your answer will NOT be put them in a crate unless they are working. No, it’s not as simple as that 🙂 I don’t like this approach at all, I would hate if my dog played with me just because that’s his only option. My dogs are free to play with each other as much as they want, they also often have an opportunity to play with other dogs, we meet deer on our walks almost daily… -- but I do devote some time to each individually every day, either to do agility or tricks (or both if we have time) and that’s for sure their favourite time of the day. I think they know they can do all other stuff they want on other occasion 🙂 I make sure I never push them into working with me, it does happen with a puppy that she gets distracted before I planned to finish a training session, but that’s fine with me, we’ll do another, shorter and more fun one next time. So I guess that would be my advice for those whose dogs get distracted: make your sessions more often, but shorter, more intense, more fun, reward more, play more. Hope this helps a little. I am not able to see this video. Is it me or how it was posted.